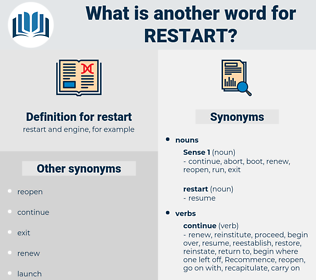 What is another word for restart? restarting, fresh-start, re-boot, resume, reset. restarting, rebooting, resume, resumes, resumption, reset. restarting, relaunching, recommencement, relaunch, re-launch, rebooting, resume, resumption, reset. 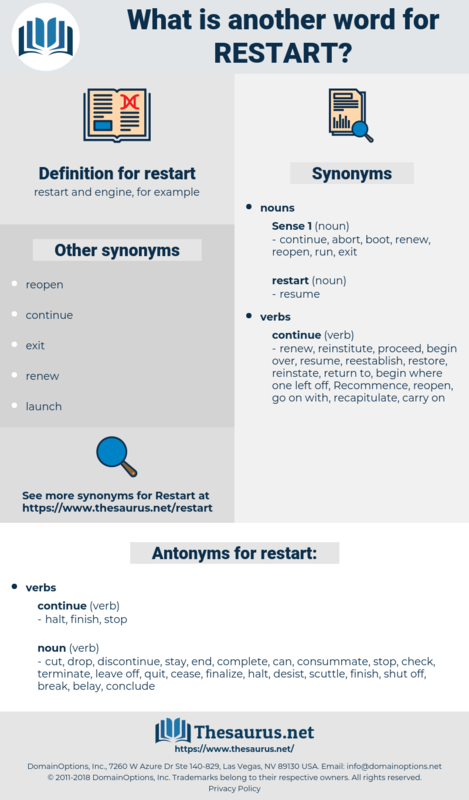 Recommence, Re-open, reinitiate, revitalise, relaunch, re-boot, re-launch, resume, reset. reopening, reload, re-establishment, revitalisation, recovery, resurgence, restoration, reinvigoration. reactivate, revive, lay, reopen, kick-start, reinvigorate, restore, revitalize, reinstate, jump-start, resuscitate, renew, re-establish, retake, re-activate, re-engage, rekindle, re-energize, redo, regain, reassert, regenerate, recover, initiate, resurrect, reignite, retrieve, reestablish, rejuvenate, reconvene, revisit, revert, reseat, rebuild, stimulate, rehabilitate, jumpstart, reintroduce, re-enable, activate, restate, reclaim, reinitialize, recreate, reconstruct, rewrite, invigorate. cut, desist, belay, can, conclude, check, drop, finalize, terminate, quit, shut off, stay, cease, discontinue, end, scuttle, complete, break, leave off, consummate. Rosa Odorata, rostrate, registered, rust-red, rag trade, Reseda Odorata, roughdried, Rectorate, re-start, rusty-red.